I can still remember my grandmother’s dulcet tones, tinged with her mellow Galloway accent, consoling me with “Phillip dear, beautiful things come in small boxes,” after being concerned about not reaching my target height for a seven-year-old. 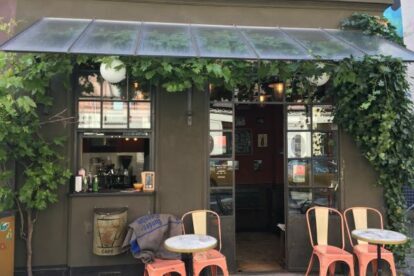 Sitting in Copenhagen’s – technically Frederiksberg’s – smallest café, Central Hotel & Café, my grandmother’s words come streaming back to me. This tiny and impeccably styled café has become a treasured institution in the best sense of the word since opening its doors in 2013. And if the five indoor seating café doesn’t impress, then this gem is accompanied with a one-roomed hotel styled by its owner, Leif Thingtved, obviously a man with an eye for detail and a deep-rooted passion for 1950’s industrial design. It is remarkable that Hotel Central & Café has only existed for 4 years, it feels that it has been a part of Copenhagen’s DNA for generations. Located just around the corner from the iconic Værnedamsvej, the hotel and café is THE destination for visiting urban dwellers seeking a unique local experience. Hotel Central & Café exudes charisma, originality and style confirming my grandmother’s wise words that beautiful things truly do come in small boxes.